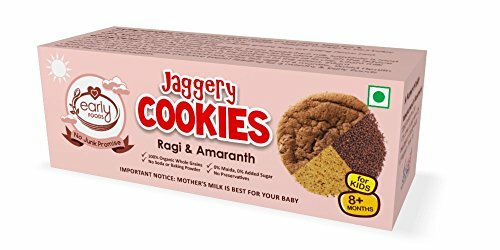 These cookies are freshly homemade from organically certified whole Ragi & Amaranth flour, Jaggery, superior quality dry fruits & seeds that add natural vitamin and mineral supplements to your child's diet. - Freshly prepared batch of cookies once you order online. We at Early Foods are committed to make your little one's first experiences with food positive. The first 1, 000 Days are critical to creating a healthy wellness blueprint, so we introduce delicious organic ingredients and beneficial natural nutrients that nourish the body and shape a healthy relationship with food early on. Freshly made jaggery cookies from India. Contains over Ragi & Amaranth which are extremely rich sources of calcium. And over 10% of dry fruits and seeds to make every bite nutritious. No Baking Powder, No Soda, No Egg. This is exactly what babies need - Pure & Natural Foods that form a strong framework for their healthy future. 0% Sugar. Sweetness from Organic Jaggery & Dates. Its a complete no junk promise.